Canadian tech professionals eager to get a foot in the door with a new employer may want to seriously consider project work. Research shows with the economy still in a slump, hiring managers would rather bring in new people on a contract basis before taking them on full time. This was the preference expressed by eight out of 10 chief information officers (CIOs) in a recent survey developed by Robert Half Technology (Canada). Conducted by International Communications Research, a full-service market research firm headquartered in Media, Penn., the survey was based on telephone interviews with more than 270 CIOs from companies across Canada. An overwhelming majority of the CIOs polled (82 per cent) said in the current environment it’s either very valuable or somewhat valuable to have a prospective employee work on a project or contract basis, prior to potentially hiring the person full time. Only 16 per cent believed such an approach is not valuable at all. The growth in contract work opportunities in Canada’s high-tech sector is mirrored by an across-the-board increase in self-employment. Self-employment in Canada rose in June, according to the latest StatsCan Labour Force report published July 10. 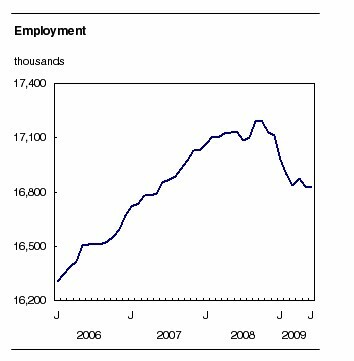 Since last October, self-employment has grown by 1.5 per cent. The report suggests that the growth in self-employment is related to a decline in regular employment at least in the private sector. In that regard, youth aged 15 to 24 were hardest hit in June, with losses of 33,000. Their unemployment rate went up a full percentage point to 15.9 per cent, the highest rate in 11 years. Employment losses for youth in June were offset by gains among people aged 55 and over. In June, employment was virtually unchanged in all provinces, except Newfoundland and Labrador, where it went up. Industries with notable declines were manufacturing and business, building and other support services. Project work as precursor to possible full-time employment can be a win-win option for both employer and employee, suggests a Robert Half Technology executive. Today, “avoiding costly hiring mistakes is even more critical, as companies are working with leaner teams and tighter budgets,” noted Sandra Lavoy, a vice-president with Robert Half Technology. She said the project work stint allows both employer and potential hire to assess the role before a full-time offer is made. Her firm has witnessed an increase in the number of laid off IT workers registering with the firm as project professionals. What are the sought after skills? She said any IT role that will help a company improve efficiencies and provide cost savings is currently in demand, both on a contract and full-time basis. In separate CIO survey, also developed by Robert Half Technology, 33 per cent of those polled said IT workers could be unemployed as for as many as six months before it would adversely affect their careers. In this context, an oft cited benefit of contract and project roles is that they allow IT professionals to avoid résumé gaps, which can hinder a job search. While these considerations (keeping skills up-to-date, paving the way for a full time role etc.) are leading many to seriously pursue options such as project/contract work — south of the border, an unemployed IT grad has embarked on a more radical course of action. Incensed at being unable to find work since she earned her Bachelor’s Degree in April, Trina Thompson of New York has gone to court. She is suing her alma mater — Monroe College, demanding the $70,000 she spent on tuition be refunded to her. In her suit, filed in Bronx Supreme Court on July 24 Thompson claims the college hasn’t lived up to its commitment. She specifically faults Monroe’s Office of Career Advancement for not providing her with promised leads and career advice. The New York Post reports that Thompson’s mother Carol – a substitute teacher – has come out in support of her daughter’s suit. According to the Post story, mother and daughter live together and are struggling to get by, as Carol is the only breadwinner. Monroe College, meanwhile, claims Thompson’s lawsuit is “completely without merit” and insists it helps graduates in their careers. In response to Thompson’s action, Monroe College’s Director of public relations, Gary Axelbank, said in an e-mailed statement that the college still wants to help Thompson find work.